links (no lenders) and will include those which are appropriate, reputable and "useful". VA Home Loans The official site of the Veterans Administration home loan benefits and programs. VA Compromise Loan The Veteran's Administration site for a short sale of a VA loan. BAH Search Find the Basic Allowance for Housing for any zip code and any rank. DOD Travel Regulations Per Diem, allowances , temporary lodging and more. The Marine Corps Official DOD site of the Marine Corps. Ask for help: Don’t be afraid to let your friends know what you need when they ask; they want to help. You can also reach out to confidential 24/7 services like the Veterans Crisis Line. 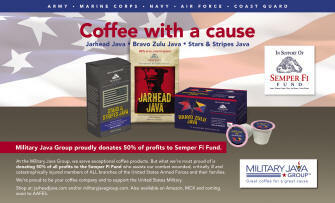 50% of all profits goes to the non-profit Semper Fi Fund/America's Fund. Give as house warming gifts or keep the office alert while supporting our Vets. Now also available by the case. Veterans Advantage Veterans advantage offers veterans, military, army, navy, coast guard, marines and retired benefits and discounts, savings, memberships, etc. YourMilitary.com 250 military markets nationwide providing local information. Commercial, for profit, site. VetPower.Org Their mission is to help our Veterans successfully launch their own businesses or find employment in growing sectors of our economy. 501(c)(3) military nonprofit charity. Blue Star Families Support Services	Founded in 2009 by a group of Military families, this nonprofit organization grew to more than 150,000 members and over 35 communities and chapters around the globe. Programs and services reach more than 1.5 million military families every year. Veterans of Foreign Wars The Mission: To foster camaraderie among United States veterans of overseas conflicts. To serve our veterans, the military and our communities. To advocate on behalf of all veterans. Resource List of Military Charities A non-profit organization devoted to providing a college education to every child who has lost a parent while serving in Army, Navy, Air Force and Marine Corps Special Operations during an operational or training mission. Provides information and resources to military parents who have a child with special needs. MilitaryLife is dedicated to enriching the quality of life of military families everywhere. Featured articles provide great insight and “insider” information for active duty, guard and reserve members, retirees, and military family members. Inman News Inman News is the leading source of independent real estate news, information, advice, research, opinion and commentary for industry professionals and consumers alike. 360Training Agent Campus FREE Downloadable Real Estate Career Guide! Oakley Sign Co. Real Estate Signs a family owned business since 1972, it is the nation's leading printing company, specializing in real estate yard signs. Zillow Advertise homes for sale or rent or yourself and your services. Ribbet Photo Editor An easy and fun way to edit photos online - make your marketing photos show off your homes at their best. Website Box Realtor Website for only $99 with no monthly fees. Full featured websites including IDX. Brian Tracy Discover Brian's proven techniques and strategies for greater success in sales, time management, self-development, personal wealth, business, leadership, and more at BrianTracy.com. ExpressCopy.com direct mail, printing, discount printing, marketing, postcards, post cards, advertising, directmail, business cards, flyers, brochures and more.